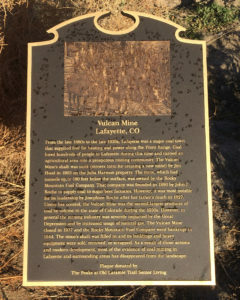 • The photo on the plaque is not the Lafayette Vulcan mine. The Vulcan mine in Lafayette used the shaft method of mining, which is a large A-frame tipple structure topped by a pulley wheel and situated over a deep vertical shaft. The photo used on the bronze sign depicts a group of miners in front of a hillside slope mine — the main pulley and cabling are at ground level and run horizontally in relation to the mine tunnel dug into the hillside. Two coal mines in Lafayette’s city limits used the slope method, the Cambro/Pluto and the Paramount. The photo on the plaque came from Louisville Historical Museum files and is mislabeled. My guess is that the photo represents the Gorham slope mine in Marshall. Archive photo from the Louisville Historical Museum showing a group of miners at a slope mine is incorrectly labeled as “Vulcan mine” on the back of the picture, but shows an altogether different mine — perhaps the Gorham slope mine in Marshall. The Vulcan mine in Lafayette was a shaft mine. • John J. Roche didn’t found Rocky Mountain Fuel Company. The company’s history has many branches, but Edgar Edmund Shumway is generally attributed (particularly in his obituary) with making the company a dominant coal producer. He opened Shumway & Company in Denver in 1892, then acquired Stewart Coal & Lime Co. in 1893 — which was renamed Rocky Mountain Fuel Company in 1895. John Roche’s 1927 death notice, published in the Rocky Mountain News and Denver Post, states that John Roche was in Omaha, Neb. during the formative period of RM Fuel, and didn’t move his family from Nebraska to Denver until 1907. Historical evidence shows that Roche interviewed at RM Fuel in 1906 and joined the company in 1907. He became a major shareholder in about 1915, and wasn’t appointed general manager of the company until 1922, after the death of company general manager D.W. Brown, who succeeded E.E. 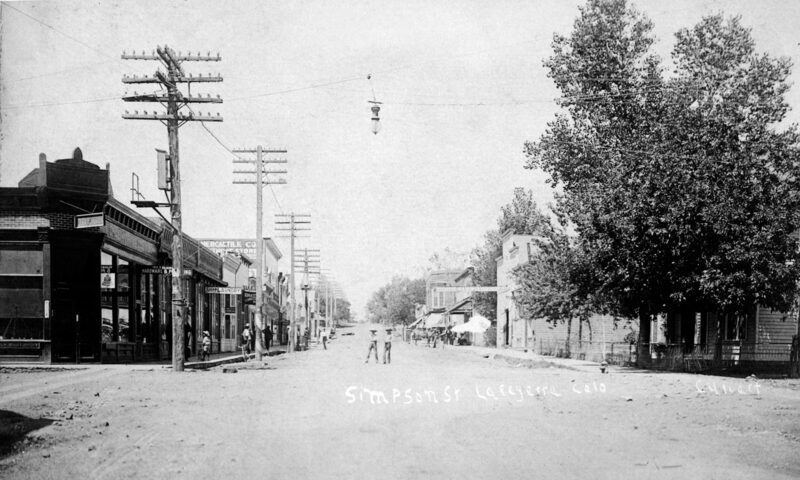 Shumway in 1914. Josephine Roche acquired RM Fuel Co. shares (in addition to her late father’s shares), and gained control of the company in March, 1928. 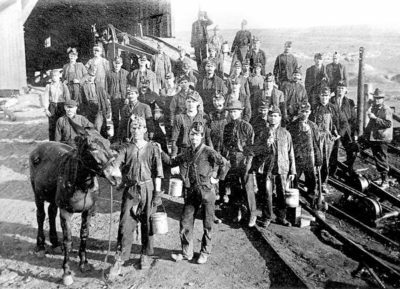 • In later years, Rocky Mountain Fuel Company did supply sugar beet factories, but the company was founded to supply heating coal and steam coal to Denver homes and factories. The balance was used by the railroads. • The Vulcan mine wasn’t the state’s second largest producer of coal during the 1930s. During its history, 1903-1937, the mine barely broke into the top dozen coal producers in the Northern Field, and as attached Colorado state mining records show, was well behind the larger local mines such as the Columbine and Hi-Way. The Lafayette Vulcan mine is often confused with the Coryell Vulcan mine, also owned by RM Fuel Co., but the Coryell coal mine was located in New Castle and closed in 1918. A lot of money went into making the Vulcan bronze interpretive sign, but the misinformation it now memorializes brings up the need for proper vetting and standardization of permanent signage, particularly adjacent to and on the Coal Creek and Rock Creek trails. Here’s the full documentation refuting the Old Laramie Trail Senior Living residence plaque’s historic narrative: Not the Vulcan mine (PDF). And a letter to the City of Lafayette about the same: Vulcan sign incorrect (PDF).